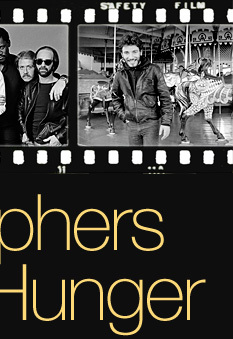 Together with “Photographers Against Hunger,” we’re encouraging fans of Bruce Springsteen to donate $25 to the Community FoodBank of New Jersey. 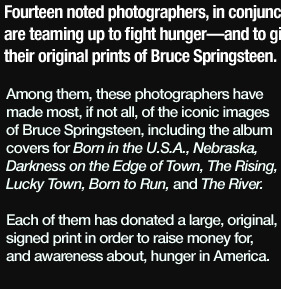 This is an opportunity to, in the words of one of the photographers, “become a part of the spirit of what Bruce and the band have always been about,” and in return, you’ll not only be helping a noble mission in Springsteen’s backyard, you’ll also get a chance to bring home an extraordinary work of art, thanks to the generosity of these 14 noted photographers. Your donation is your way of saying that you want to be part of thisof taking the next step to participating in the dream that we are working on. For decades, Bruce Springsteen has encouraged his fans to support local organizations that fight poverty and feed the hungry, describing food banks across the country as “on the front lines" in this battle. Their work becomes doubly difficult during trying economic times, as the need grows while financial support proves tougher to come by. The Community FoodBank of New Jersey’s recent “We Can’t Let This Bank Fail!” campaign shines a light on the increasing difficulty of meeting demand, where in just the past year, they’ve seen a 20 percent increase in the number of people seeking food assistance in the Garden State. For each $25 donation, you’ll be entered into a drawing for an original print by one of the Photographers Against Hunger. There is no limit to the number of donations you can makebut the deadline is coming up fast: this Saturday, May 23, at noon is your last chance to donate to this campaign and enter the drawing. In a random drawing on Saturday afternoon, 18 very lucky people will be chosen to receive one of the signed prints that the photographers have given to the cause. The prints will be awarded randomly to each of the 18 randomly selected donors. But of course there are no “losers” hereeveryone who donates will be helping a few people who would otherwise go hungry. 18 prints? 18 winners? I thought there were only 14! Over the course of the campaign, several "Photographers Against Hunger" have stepped up to sweeten the pot and improve your odds. 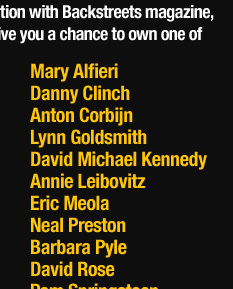 Most recently, Eric Meola and Barbara Pyle have each contributed new images for the drawing. Previously, Danny Clinch and Neal Preston also donated second prints to the cause, Preston's being an enormous, 30x40 color image. So with the end of the campaign just around the corner, your odds are even better than we original announced, with 18 very lucky people will be chosen at random to receive an original, signed print. See these four new additions in the gallery below. These 18 striking images span Springsteen’s entire career with the E Street Band, from Mary Alfieri’s shot of a bearded Bruce in front of the Asbury Park carousel, to Albert Watson’s Rolling Stone cover photograph from this year. 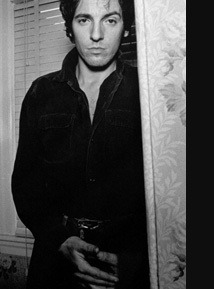 The E Streeters themselves show up in a Darkness-era tough guy group portrait from Lynn Goldsmith, and also in the least-seen image here, Barbara Pyle’s dawn rehearsal shot on the very day Born to Run was finally finished. From Danny Clinch, a classic leap of faith. 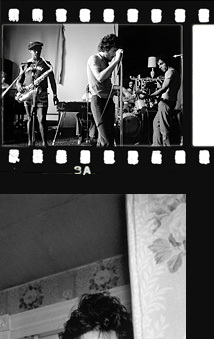 More venue shots from Annie Leibovitz, going backstage in Philly; and Neal Preston, capturing Bruce in front of the stage, soundchecking in Kyoto (a shot that became the cover of Dave Marsh’s Bruce Springsteen On Tour: 1968-2005). Outside the concert arena, David Michael Kennedy contributes a numbered, limited edition palladium exhibition print from his Nebraska shoot. 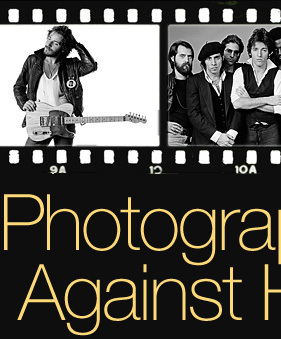 Eric Meola, Frank Stefanko, Anton Corbijn, David Rose, Timothy White, and Pam Springsteen also offer rare and iconic studio and album session photographs. The fine art gallery value of each of these magnificent photographs ranges from $1,000 to $7,500 each. All are large format, original prints signed by the photographers and donated directly for this cause. Click on the thumbnails below for more information, and click here to make your donation and enter the drawing now! Only 14,000 donations will be accepted as part of this project. Each $25 donation to the FoodBank provides one chance, with 100 percent of the proceeds going toward supporting the FoodBank’s efforts. There is no maxiumum number of donations, or chances, per person. Donations will be accepted beginning on April 23, 2009, through May 23 at noon. Each donation will be assigned a number corresponding to the order in which the donation was received. Winners of the prints will be selected using a random number generator in a drawing on May 23, and announced on Backstreets.com news page on May 25. Employees and family members of employees working on this campaign are excluded from entry (including members of "Photographers Against Hunger," The Backstreets Publishing Empire, Inc., Community FoodBank of New Jersey, and Coyne PR).